The following summary should be read in conjunction with “Trial and Error?” and other articles on this website. The judge at Jens Soering’s 1990 trial was a friend of the victim’s family. On the day the trial began, a local magazine published an article quoting the judge’s opinion that Jens “did it.” Yet, under the Virginia court rules, it was the judge himself who was allowed to decide whether to remove himself from the case. He decided he could be fair. The judge ruled that the local jury pool in Bedford County had been tainted by nearly four years of pre-trial publicity. Yet he then chose to import a jury from a neighboring county that received exactly the same newspaper and TV coverage as Bedford County. Most of the jurors seated on Jens’s jury said that they had formed an opinion about his guilt, but would be able to set that opinion aside for the trial. None of this was appealable before trial – only after, when it was too late. 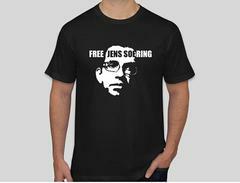 Jens’s defense counsel lost his license four years after his trial. In his bar association “trial,” the lawyer said that he had been mentally impaired for the entire period of Jens’s trial and first two appeals. These events were incorporated into Gail Marshall’s subsequent habeas corpus appeal. She obtained an expert affidavit by a past President of the Criminal Law Section of the Virginia Bar Association, now a federal magistrate, according to which Jens would not have been convicted but for the inadequate legal services of his trial lawyer. The state did not offer an expert of its own to contradict this finding. Yet all appellate courts ruled that Jens’s trial lawyer’s mental impairment did not warrant a new trial, because supposedly there was no clear evidence of error. It is now commonly known that, of the over 150 prisoners who have been exonerated through DNA – and therefore are provably innocent – more than 20% had confessed. Examples of high profile false confessions include the Central Park Jogger case, Earl Washington, Jr., and John Mark Karr (JonBenet Ramsey case). All of this was completely unknown at the time of Jens’s 1990 trial. At that time, confessions were still regarded as iron-clad proof of guilt. Unfortunately, there is no legal vehicle – no form of appeal, no brief, no writ – that allows prisoners to raise the issue of false confessions in court. Although there was a drop of blood at the crime scene that might have proved Jens’s innocence, this biological sample was destroyed in testing during the late 1980s. Thus there is no DNA evidence that can exonerate him beyond a doubt. This is a common problem for wrongly convicted prisoners; for many of them, the popularity of DNA tests is actually a disaster. Contrary to the forensic fantasies on TV, the majority (!) of crime scenes do not yield any biological samples whatsoever. But the general public and the courts now expect the iron-clad proof of DNA evidence every time, thanks to Barry Scheck and his Innocence Project. For the majority (!) of prisoners whose cases do not have DNA, there is now virtually no hope. In Jens’s case, there is one new form of forensic/scientific evidence or testing that could exonerate him: AFIS, the national fingerprint database. This was not available at the time of his trial in 1990, but is available now. At the crime scene, police discovered an empty shot glass on a side table near one victim’s body (Derek Haysom’s). Both victims were heavily inebriated. On one side of the shot glass was the victim’s fingerprint (Derek Haysom’s), and on the other side was a fingerprint whose owner has never been determined. However, that fingerprint cannot be run through the AFIS system without a court order – and no court will order it to be analyzed by AFIS because, of course, the “real” killer is Jens Soering. In 1996, the Virginia Supreme Court ordered an evidentiary hearing to determine the value of new evidence developed by Gail Marshall concerning two drifters found near the crime scene who later committed another murder. Under the current system, this evidentiary hearing was held by the same trial judge who had presided over Jens’s 1990 trial – the friend of the victim’s family who gave the notorious magazine interview. If he had ruled in Jens’s favor at the evidentiary hearing, he would in effect have determined that he had made a mistake in 1990 – something no one is likely to do, no matter what one’s profession.